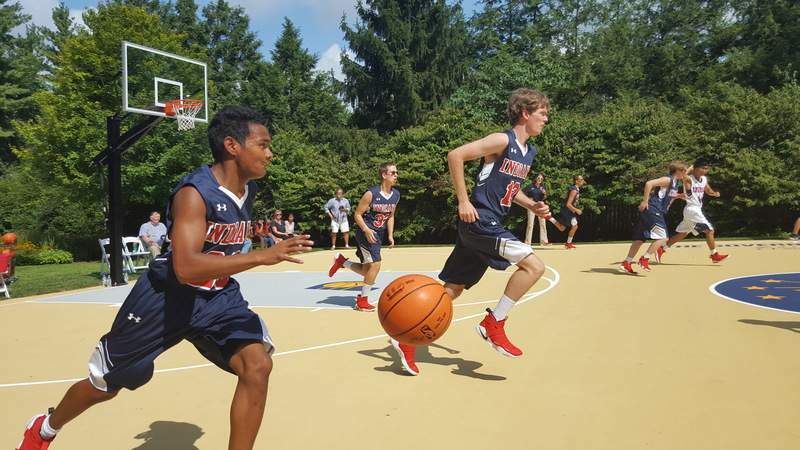 Niki Kelly | The Journal Gazette Romano Ritenour, left, and Austyan Marquardt, center, take the ball up the newly dedicated court at the Governor's Residence. The gold-medal-winning DeKalb County Special Olympics team was the first to tip off on the court. Marquardt, 16, is from Auburn and Ritenour, 17, is from Garrett. 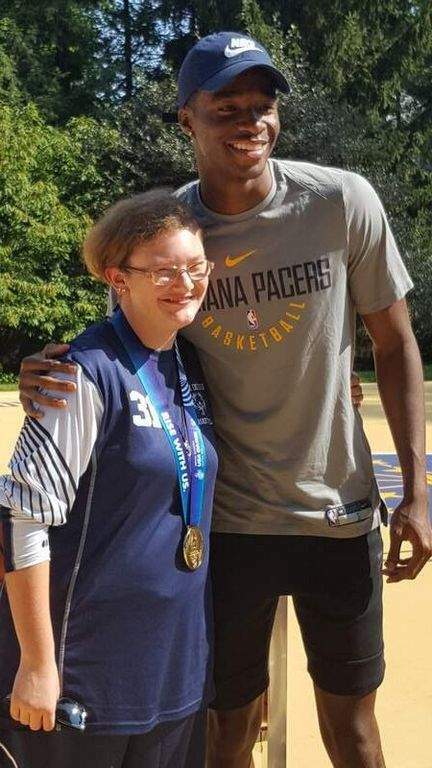 Ashlyn Heller, a member of the gold-medal-winning DeKalb County Special Olympics team from Auburn, meets Pacers player Edmond Sumner at Saturday's event. Niki Kelly | The Journal Gazette The Governor's Court ready for its debut Saturday at the Governor's Residence in Indianapolis. INDIANAPOLIS – Gov. 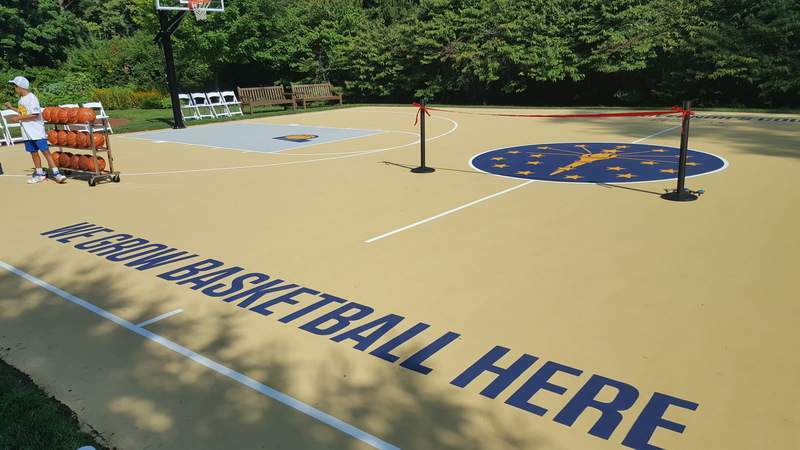 Eric Holcomb got a little help Saturday from the DeKalb County Special Olympics basketball team to inaugurate the court at the Governor's Residence. The team won national gold in July in Seattle and was honored to play the first game on the new court. Holcomb threw the tip up and then watched from the sideline as the 10 members split into two teams and scrimmaged. The white team took an early lead, but the blue team made a late comeback to win 12-8. A crowd of about 100 – many from northeast Indiana – cheered loudly. Her mom smiled to the side as Heller, 29, talked of learning to be more aggressive on the court in the last year. She is the only female team member. She lives in Auburn and was born with brain damage. Traditionally, each family that lives in the Governor's Residence makes an improvement to the buildings or grounds. The court was funded by private donations and officials would not release the cost. Brooke Funkhouser, the architect of the project, said it wasn't built just so Holcomb could play ball with his friends. It will host youth league games and community events. She noted there were many iterations of the court – from the materials used to the color scheme, size, logos and location. It was originally the size of a college court but was reduced to a junior high size so as not to encroach on the nearby garden area. And to appease the neighbors, there are no lights.